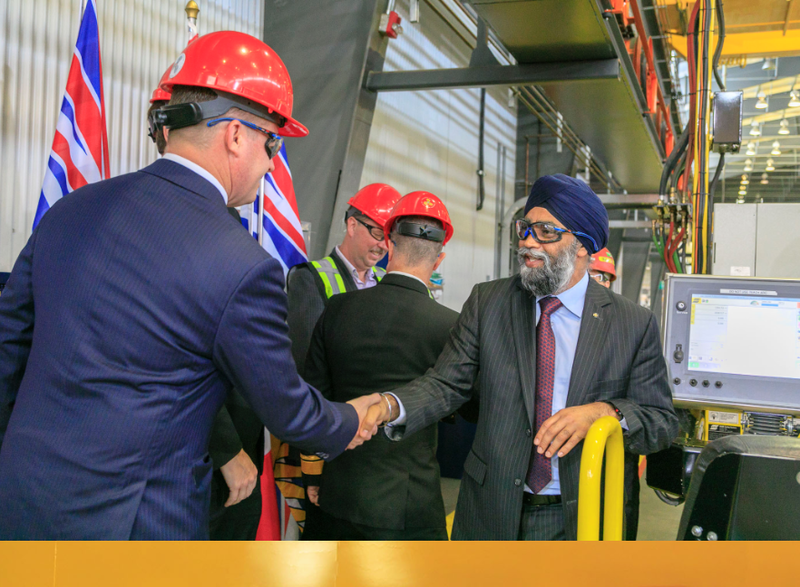 Today, joined by representatives from industry and government, Seaspan Shipyards (Seaspan) celebrated the start of construction on the first Joint Support Ship (JSS) for the Royal Canadian Navy (RCN). The steel cutting ceremony held at Vancouver Shipyards is a significant milestone for Seaspan, the National Shipbuilding Strategy (NSS) and Canada’s shipbuilding industry. With the start of construction on JSS, Seaspan is leading the way in rebuilding Canada’s shipbuilding industry. In addition, start of construction ensures that Seaspan will see the continued growth of Vancouver Shipyards’ workforce while mitigating any possible downturn in production. With the start of construction on JSS, Seaspan will ensure that continuous production is realized on its work as Canada’s non-combat shipbuilder. At its peak, work on JSS will contribute towards sustaining an estimated 1,000 jobs for tradespeople and approximately 300 office staff at Vancouver Shipyards. In addition, Seaspan’s work on JSS will leverage its broader Canadian supply chain and support the continued growth of Canada’s shipbuilding and marine industries. At over 173 metres in length and with a design displacement of nearly 20,000 tonnes, JSS will be among the largest ships built on Canada’s West Coast once complete. JSS will support the RCN’s work at home and abroad for both defence and humanitarian missions. These ships will deliver fuel and other vital supplies to vessels at sea, offer modern medical and dental facilities, and providing support for helicopter operations and equipment repair. To be built to the highest standard and with modern equipment, propulsion redundancy, a 30+ year life expectancy and the ability to stand in harm’s way if required, JSS represents a complete solution to the operational needs of Canada’s Navy. Canada’s shipbuilding industry has been rebuilt thanks to the NSS and it is delivering on the promise of ships built in Canada by Canadians. To date, Seaspan has $600M in committed contracts and engaged approximately 500 Canadian firms thanks to its NSS-related work alone. Construction on JSS will contribute to the continued growth of Canada’s shipbuilding and marine industry.